This year, take a train ride across America as our annual holiday show Season's Greenings showcases train stations! Plant-based recreations of iconic train stations from across the United States will be represented in the train room. Explore classic stations like New York City's Grand Central Terminal, St. Louis' Union Station, and many more. Thousands of blooms will be on display throughout the Conservatory, including a showcase of heirloom and newly developed poinsettia varieties. Our collection of D.C. landmarks made from plant materials will return to fill the Garden Court, this year including a botanical version of Washington, D.C.'s Union Station. Join us as we celebrate the holidays and America's railroad history. Please note: Due to the ongoing roof and facade project in the Conservatory, waiting time to enter this year's holiday show may be longer than usual. The popular model train display requires a separate entry point often resulting in a line. Individuals and caregivers of visitors that are unable to wait in line due to sensory-processing and/or cognitive developmental disabilities may request, in advance, an easy access pass to advance through the line. As a courtesy, we ask that you limit the party size to four individuals. Sensory-friendly programs are scheduled during the holiday show that provide entrance for registered participants, pre-visit materials, and a take-a-break space. Please contact Maura Nelson, mnelson@aoc.gov or 202-226-1047 for more information on the easy access pass or sensory-friendly programming. For additional information, please visit our Accessibility page. We welcome - and encourage - personal photography at the U.S. Botanic Garden. Due to the increased number of visitors to the Garden during Season's Greenings, tripods cannot be used on throughout the run of the exhibit. We do not allow visitors to do photoshoots or videoshoots at the Garden. Please read the full Photography and Art Policy for more details. During Season's Greenings, there are two entrances to the Conservatory on Maryland Avenue SW. The Model Train Entrance provides entry to the model train exhibit. After you've seen the trains, you can view the rest of the Season's Greenings exhibit throughout the Conservatory. The Conservatory Entrance bypasses the main train display and provides entry to the rest of the Conservatory. You'll find seasonal plant displays throughout the Conservatory, replicas of the capital's landmark buildings in the Garden Court and two of the largest indoor decorated trees in Washington, D.C. Due to stone and roof restoration work, the large trees are in the Garden Court and not the West Gallery. As such, there is no train around the tree this year. Find all the trains in the West Gallery using the Model Train Entrance. In short, if you want to see the model trains, please use the Model Train Entrance. Group tours are not offered during Season's Greenings, but resume in January each year after the holiday exhibit is over. This year's holiday show will feature models representing more than 30 train station models from around the United States -- all made from plants and natural materials! Coming soon: Explore a guide to see all of the attractions; all the plants used to make them; and trivia about each one! Train Station Models Building Guide 2018 [PDF] -- learn about the history and associated agriculture and plant stories of all 31 buildings and dioramas in this year's train show! 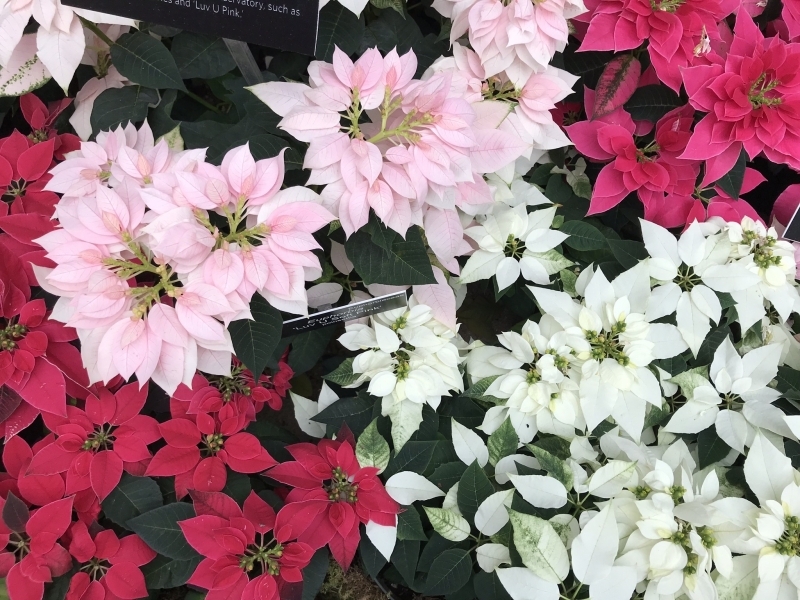 Learn about our 3,000+ plant poinsettia display -- showcasing heirloom varieties all the way to newly developed ones yet to come onto the market! Holiday cheer abounds at the U.S. Botanic Garden! Despite the cold winter outside, the Conservatory boasts a tropical paradise, one of the largest indoor decorated trees in Washington, D.C. and a showcase of poinsettia and their plant cousins. It wouldn't be the winter holiday season without the fantasy train display in the East Gallery, which chugs along a track through imaginative structures created with plant materials. Explore the seven seas, using lighthouses to navigate your way through this year's scenic wonderland. Many of the capital's landmark buildings, all made from natural materials, will be on display in the Garden Court. Come in from the cold and enjoy the sights, scents, and sounds of Season's Greenings. Follow us on Facebook to find more photos and videos from the exhibit!